Sensory exploration in the Nursery classroom is one of the most important aspects of the learning process. Refining the senses helps build the skills necessary for further academic and creative development. Sensory exploration at this age allows the child to experience new concepts and knowledge on a deeper level, where they are more likely to remember what they’ve learned, and apply it to future experiences (both inside and outside the classroom). Sensory exploration can be applied across multiple learning styles, so it fits very well into our differentiated curriculum. 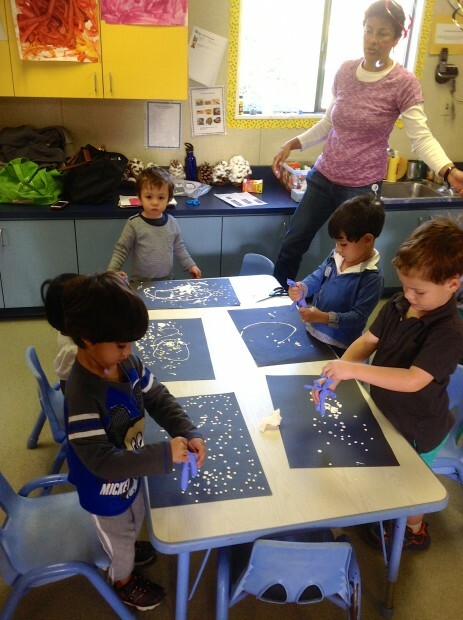 We strive to use sensory experiences to heighten the students’ learning and engage their imagination. During our first trimester, we worked within a “farm” theme to focus on developing the tactile, visual, auditory and olfactory senses. Our goal was to bring the children as close as possible to the “real” experience of a farm. Prior to the unit, students were introduced to smaller farm animals with a mobile petting zoo. The students were able to have hands on experience with lop-eared bunnies, chickens, lambs, goats, and pigs. As they observed the animals they were posed leading questions related to both tactile and olfactory senses. What does the coat of the lamb feel like? How does the milk from the goat smell? How are the pig’s feet different from the bunny’s? These leading questions allow the child to begin detailed observation. With the theme now introduced and questions buzzing, we began to study the animals, their habitats, and their sounds. Students created a farm mural from raw natural materials, for example using real hay for the silos. They were asked to use their critical thinking skills to construct barns from a few shapes presented to them. The goal was for the students to find their own way of fitting the square, rectangle, trapezoid and half circle together to construct their barn. Next, students placed grains in the silo and hay and farmers in the barn. 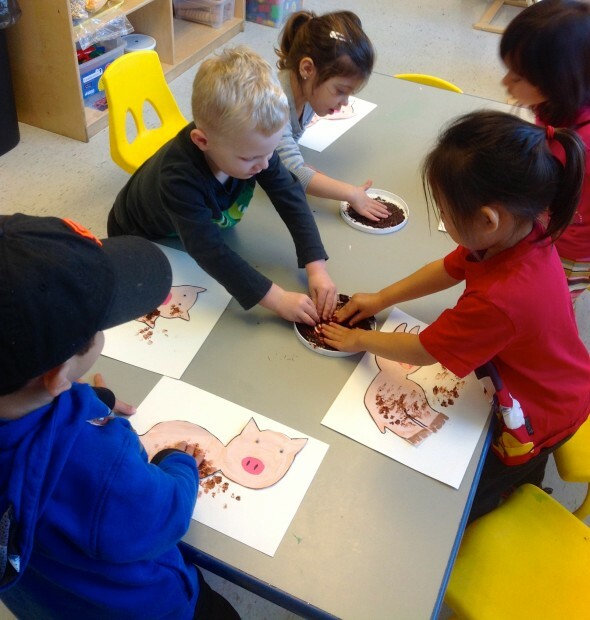 A farm sensory bin provided them with more opportunities to explore the senses on a farm. The bin included toy animals, hay, corn, apple scent, leaves, pinecones, and mini pumpkins. The problem solving carried over into the creation of their very own tactile three dimensional farm books. We began the process with several reference points upon which the children could build to create their own content for their books. We sang “Old MacDonald” while using physical representations of each animal on the farm. They continued with a Farm Animal Sound Bingo to help them identify the appropriate sound associations. Lastly, we read books about farms which explained the functions of different animals on the farm. The students were intrigued with many animals but ultimately we decided to focus on the farmer and three different animals. The process that followed was one of inquiry and creativity. We posed questions on the chosen animal’s habits, function/activities, sounds, and appearance. The children collaborated to come up with a description of each animal’s actions and sounds. For example, a child described the sheep as “soft and fluffy white,” and that they make wool for others. Students learned about sheep through the nursery rhyme “Baa Baa Black Sheep,” then used what they learned to make a sheep page in their farm books, using cotton balls to create a body that actually felt like a real sheep. Each page of the book displayed a farm animal with a sensory experience. The pigs were made with “real” mud paint made from coffee grounds, oatmeal, and dirt. 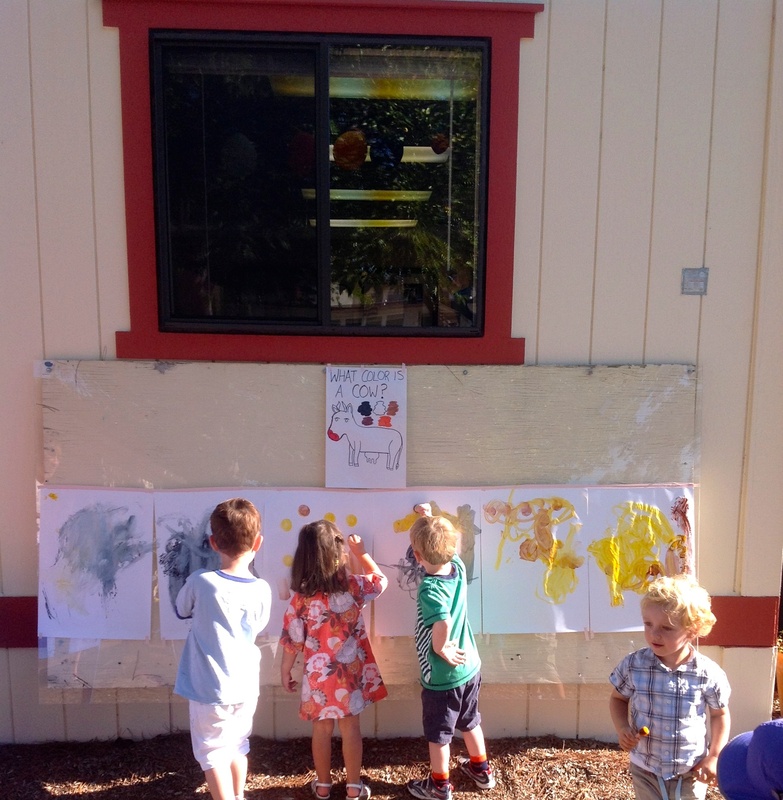 Another great example of the sensory experience in our farm theme was the “udder” paintings they made to demonstrate the cows making milk. The children painted with cow udders created from rubber gloves pricked with pins in each fingertip. 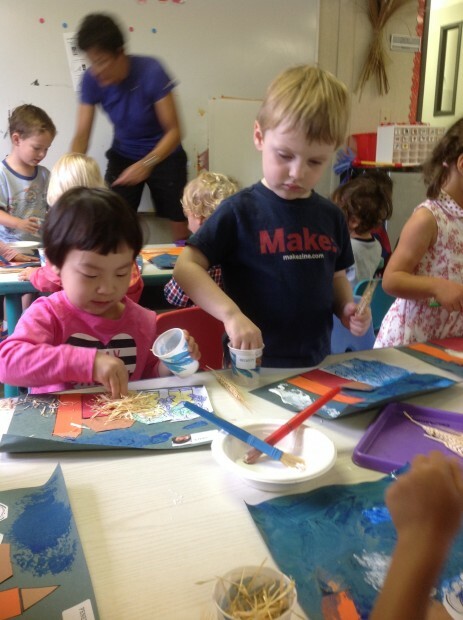 As they squeezed the white paint out of the fingertips they engaged both their tactile and visual senses. This was a lot of fun for them! It also helped develop their fine motor skills. Each of the pages were then presented and reviewed by the students and sentences were made to fit with the images. The sentences reviewed the animal’s function and sounds. After our farm unit, the sensory exploration continued through our exploration of the world of Arctic animals. The children learned the names, characteristics, and habitats of the animals, building their vocabulary along the way. We primarily focused on the walrus, orca, polar bear, narwhal, Arctic seal, and penguin. Students also learned about the native people of the Arctic, the Inuit. They created their own Arctic scene centered on an igloo made from tissue paper. They applied their knowledge of space and size to place their narwhals and polar bears in their Arctic scenes. The children were proud to see their creations displayed in their classrooms! 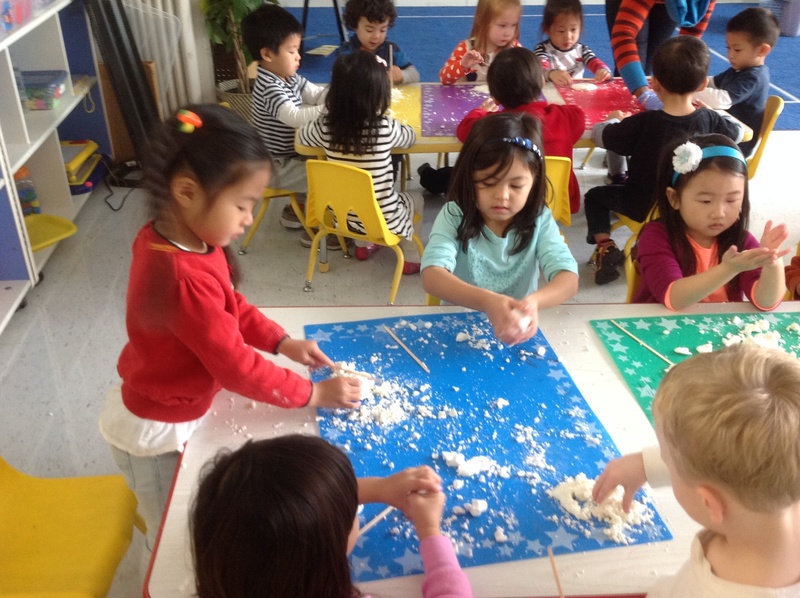 One of the most popular activities of the Arctic unit was making “snow dough.” The children helped make it and then enjoyed building igloos and glaciers. They added arctic animal figures to complete the scene! This was a great way to refine their tactile sense and encourage their imagination. 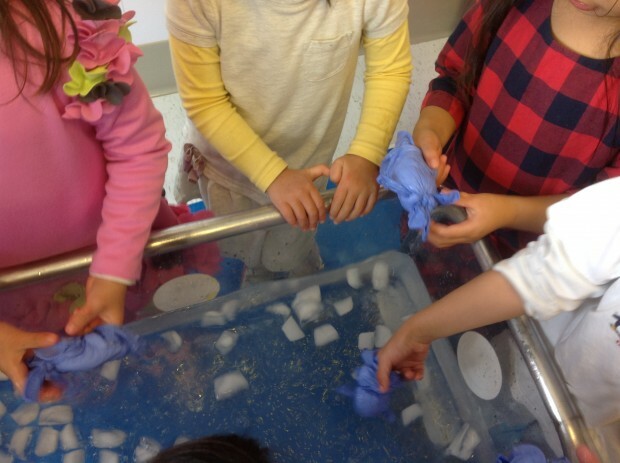 Finally, the children participated in a water and ice experiment to highlight the purpose of blubber for Arctic animals. They learned that blubber keeps the animals warm in icy water. Using latex gloves stuffed with shortening, they discovered that the “blubber shortening” kept their hand from feeling the cold icy water. This was a fun tactile experience as well! In summary, children learn best and retain more information when their senses are engaged. This also makes learning more fun! The children will always be more focused on and excited about what they are participating in throughout the learning process when it involves all of their senses.